A year ago, I hadn’t even heard of this little village. And now, I’m staring into the indifferent eyes of a cow, so exhausted (and perhaps a little delirious) that I’m wondering if I shouldn’t just sit down and stay here forever. I could learn how to make delicious cheese from my new friend’s milk, although by the look she’s giving me, we clearly need to know each other better before that will happen. I could live a simple life that wouldn’t require me to walk one more step up and down these never-ending hills. 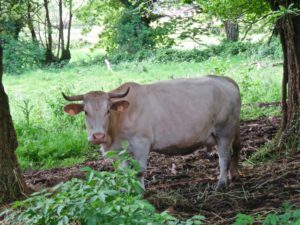 Perhaps I could open up an inn to welcome the thousands of people, like me, who trek past these cow pastures in the beautiful green hills of Galicia in Spain, looking for God. I am a pilgrim on El Camino de Santiago de Compostela, an ancient path that has been trod by everyone from 12th century monks to social media millenials. For at least a thousand years, people have walked here, doing penance, seeking healing, hoping that every step will lead them to an encounter with the divine. I am an unlikely pilgrim on this 80-mile trek. I am not a “Let’s go hiking!” kind of gal. I exercise juuuust enough to keep heart disease and general decrepitude at bay. My idea of a day in nature involves a cool drink, a good book and a nap in the shade. But after months of training, here I am, picking my way carefully up and down rocky slopes, dodging cow patties, skidding through slimy mudslides and peeing in the woods. Why? I serve God with my gifts and talents, but rarely in a sacrificial way. I give out of my abundance — of skill, of resources, of time — but always within my very comfortable comfort zone. I had always understood that verse from Romans to mean my whole life should be presented as a sacrifice. But I had come to wonder: what would it look like if I presented my actual body, the body that hates unnecessary exertion, inconvenience and discomfort, as a sacrifice to the God I claimed to love? 1. It really is possible to go uphill both ways. When I set out, I thought I was prepared, both physically and spiritually, for the challenge. I thought I had within me all that was necessary to offer this sacrifice. But the uphills aggravated an old injury, which made the downhills painful and slow. I knew this was going to be difficult, but suddenly, I feared it would be impossible. 2. Sacrifice is impossible without grace. I thought this was something I was offering to God out of my own strength and will. But my strength failed and my will only wanted to sit down by that cow pasture and become part of the scenery. It turns out I couldn’t offer this gift to God without first receiving His gift of grace to me. I was so eager to say to God, “Look what I have done for you,” that I had forgotten that He was the one who making every step possible. 3. The smallest moment of joy will sustain you. One day, my husband and I were walking when we heard singing in the distance. As it grew nearer, we recognized the familiar words from a hymn: “Here I am Lord, is it I Lord? I have heard you calling in the night …” As the singers approached, we joined in, making a hauntingly beautiful sound in a cool forest glade. There were other moments like that, when I thought I was done for, when song, or prayer, or just seeing a familiar face at the next village’s watering hole lifted me out of myself. I was refreshed, refueled, renewed. I thought this pilgrimage was all about what I wanted to offer to God. But it turns out, He had something in mind, too. Like a sauna that sweats out the impurities in your body, sacrifice can extract spiritual toxins from your soul. In my next post, I’ll explore just what God was up to on My Camino.